Imli Modern Indian Tapas is located in Soho in the heart of the West End, London. Launched by the team behind Tamarind, Imli offers a casual, but sophisticated, dining experience, with innovative cooking that is both accessible and affordable. The traditional meets modern ethos also extends to the interiors where the design concept fuses the simple elegance of modernity with the richness of Indian tradition. Modern characteristics of bold form, colour, and scale are mixed and layered with traditional Indian elements of craft, pattern, and texture to create a unique and inspiring culinary experience. Imli is laid over two floors and the main restaurant can host parties of up to 85 people seating. The ground floor and the basement can be combined for a party of up to 125 people seating or 150 people standing. 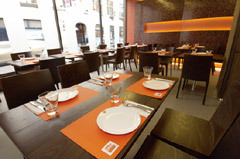 The restaurant also offers a take away service and delivery to customers within the W1 area. Imli offers tapas style Indian food and just like any other tapas, it is best shared. You may need to order about three plates to fill you up. Blended fruit beverages and a selection of cocktails complete a very balanced menu.